I recently heard that the trend of dedicated home theaters in new homes is going down. That’s too bad. But whether you have a dedicated room or not, Epson looks to have a nice entry level 3D projector. 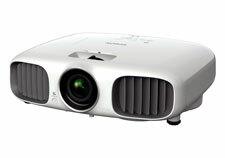 Epson’s 3D lineup also includes the step-up Home Cinema 5010 and its custom-market counterpart, the Pro Cinema 6010. The 3010 and 5010 models come in wireless-friendly versions, dubbed the 3010e and 5010e. These models feature a built-in WirelessHD receiver and a standalone WirelessHD transmitter that allow you to wirelessly send the HDMI signal from your sources to the projector. The WirelessHD standard operates over the 60GHz band at a distance up to about 32 feet. This perk adds $200 to the MSRP, with the HC3010e carrying a street price around $1,799.